Mono Black Zombie Tribal, Sidisi being the head of the snake. 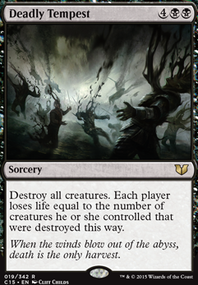 There are a number of good combos available to this tribe and color: Graveborn Muse + Zombie Infestation; Gravecrawler + Carrion Feeder + Door of Destinies; Gravecrawler + Pontiff of Blight; Gray Merchant of Asphodel + Phyrexian Reclamation. 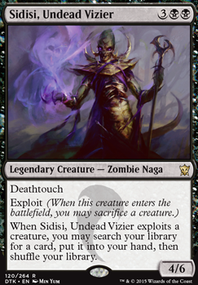 Sidisi, Undead Vizier was chosen as a way to eliminate the need for an abundance of tutors, and provides an incredibly strong body when needed. Furthermore, having a tutor on a stick is incredibly strong, and finding the necessary cards needed to counter opponent's plays or win the game is sweet. The deck appears to have fairly good recovery throughout the mid-late game, and with further tuning could provide a strong front in the early game.